Focus your feedback where the writer is struggling. When editing, it’s tempting to consider every possible path that a piece of writing could take. When I was editing a friend’s paper last spring, I realized I had begun marking every detail that I would change if I was writing the piece. The problem is that I wasn’t writing the paper – I was reading it. Instead of wasting both of our time by trying to make the paper one of mine, I tried very hard to focus only where my friend was struggling to convey an idea or was getting stuck in his own language. Good feedback focuses on the spots that are trouble for the writer himself. Doing so builds trust, making your feedback more credible and useful. 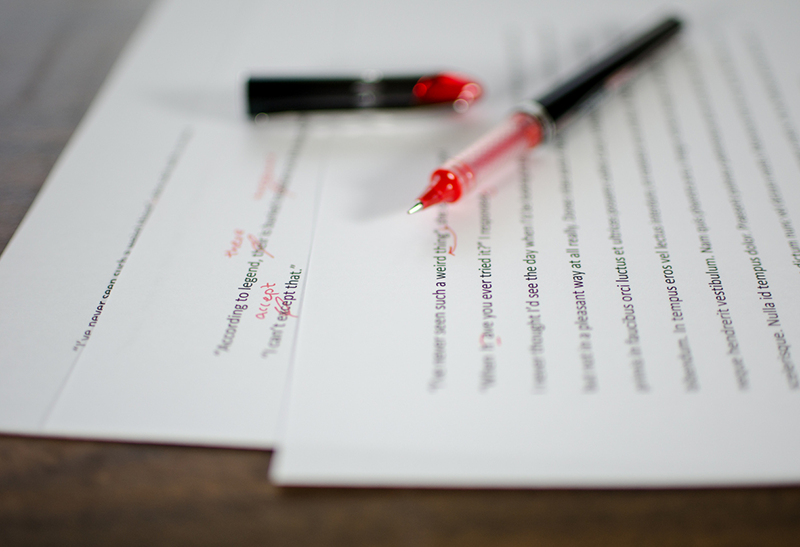 Take your editor’s feedback seriously – it’s the simplest way to listen to your readers. In most cases, your readers will not have the opportunity to ask you questions or give you feedback about what they’ve read. It’s hard to make sure that they’re on the same page. It’s hard for readers to let you know where they are lost, confused, offended, or mislead – which is exactly what an editor’s feedback is. When you’ve asked someone to edit your writing and they seem to totally miss what you’re trying to say, that’s actually useful: who knows how many readers could end up misdirected by your writing without your knowledge! Addressing the comments an editor gives you – even if they seem obvious or like they miss the mark – is the best way to make sure that your readers won’t get hung up on the same spots later. Be a safety net. It’s hard to start writing if you’re aiming to write the perfect piece in one go, but if you sit down to write knowing that you’ll be able to iterate and improve on your piece, it’s much easier. A good editor acts like a safety net: it’s easier to write a draft that’s imperfect if you know it will be edited, and that you can then iterate on it. This applies beyond writing too. A big part of feedback is iterative design – that is, design isn’t about “doing it right the first time,” but about reworking your policy, project, product or paper with input from the community of users and understanding this process to be what’s most important. Closing feedback loops in the writing process can make writing more effective and much easier. But there are lessons about feedback to be learned from writing, too. What would aid or philanthropy look like if program designers or service implementers had someone playing the editor role for them – delivering focused help where they need it most, listening to feedback at every stage, and acting as a safety net that makes it ok for them to iterate and improve? Nathaniel is a summer intern in media and communication, maintaining the digital presence of Feedback Labs and exploring new ways to effectively communicate with members. A senior at Cornell University, Nathaniel studies English and Media and edits Kitsch Magazine. He is excited to be joining Feedback Labs this summer and is continuously impressed with the quality of Feedback’s work and the dedication of the Feedback Labs community and members. In his free time, Nathaniel enjoys running, writing, silent film, and spending long afternoons in Kramerbooks.